Or so I thought. And it all began six years ago while vacationing in Hawaii. After touring an incredible pineapple plantation, we ate lunch on their grounds and enjoyed the freshest fruit and accompanying meal I have ever had. Within that meal were the brightest slivers of coral colored ginger. Having never tried it, I was easily persuaded to give it a go and proceeded to put a rather big bite of it in my mouth. I was repulsed almost immediately, but finished chewing it and swallowed it reluctantly (spitting things out just isn't very lady like, ask my mama). Any who, from that day forward I hated ginger and kept my distance from it's alluringly beautiful color. Once I discovered my love for sushi, I also discovered how much I hated it when the ginger rested gently on the sticky rice wrap. I would happily share those tarnished pieces of sushi and offer all of the ginger on my plate to anyone who actually enjoyed it. That goes for the ginger dressing too; heck no, ranch please. The dislike for ginger didn't stop with just its fresh version. The ground spice was a no-no in my book too and I didn't dare order nor fix a meal that included it. All of this complete dislike for ginger lasted until two months ago when I finally decided to be brave and give it another go. Or rather, my very adventurous husband in the kitchen would slowly add in the ingredient in small quantities. It wasn't until I discovered ginger root that I opened up to the possibility of using it in cooking, especially in marinades. I kind of love the taste of minced ginger that has been added to a soy sauce based marinade. Mind you, I don't add that much because I haven't gotten to that point in my second chance with ginger. If I can mince it up, let it soak, then discard it, I have found that I do enjoy the slight background taste of ginger on marinated meat. And I wanted to share my two favorites that I have come to love thus far. I guess you can say in this great dislike of all things ginger, I have learned to give things another try with a fresher perspective and no biases, but eating fresh, beautifully-coral-in-color ginger still isn't happening. That's where I draw the line...for now. 1/2 can (13.5 oz.) 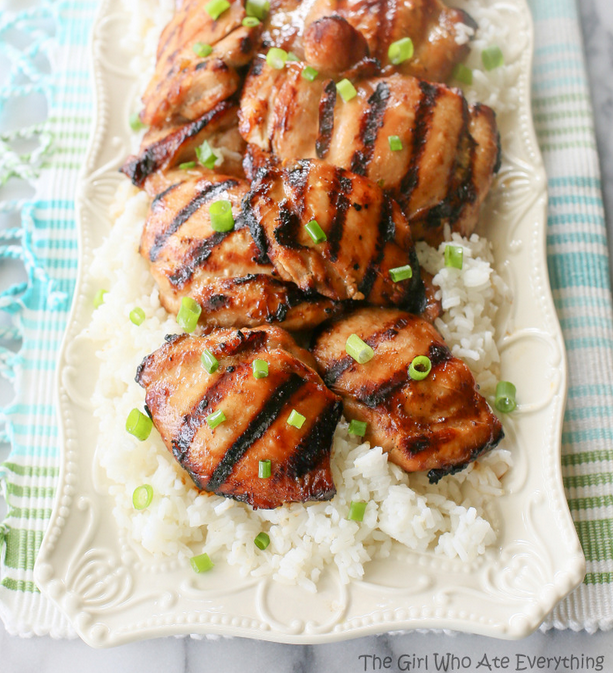 coconut milk; we did not use coconut milk when we made this marinade. Trim the chicken thighs of any fat. Mix all marinade ingredients together, stirring well. Add the chicken thighs and let marinade for at least 8 hours. Grill chicken on low for about 7 minutes on both side. Mix the marinade ingredients, stirring well. Then add the strips of flank steak. Let marinade for at least two hours. Let the bbq skewers soak in water, to prevent them from burning on the grill. 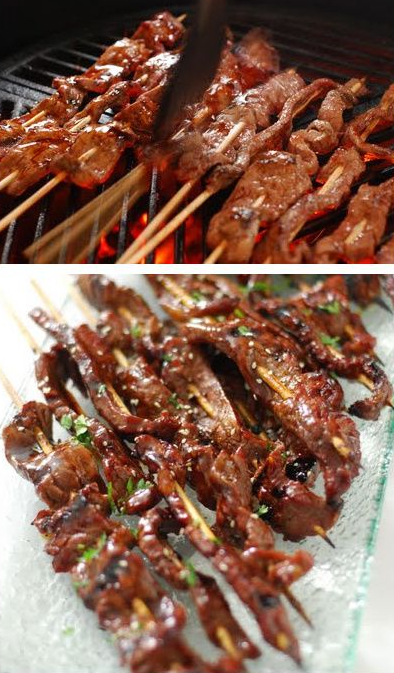 When it's time for dinner snake the skewers through the strips of the steak and place in a row on the grill. Using a brush, add more of the marinade to the meat for a stronger taste. *All recipes come from other bloggers; husband and I tweak them per our taste.